Index funds should probably pay a pivotal role in your portfolio. Five worth looking at now are the Vanguard Industrials ETF, the SPDR S&P Regional Banking ETF, the Vanguard FTSE All-World ex-US ETF, the WisdomTree SmallCap Dividend ETF, and the Schwab U.S. Dividend Equity ETF. Low-cost index funds are quite possibly one of the best inventions for individual investors. Index funds provide instant diversification without the outrageous fees many mutual funds charge. Also, by definition, they are designed to track certain indexes. That may not sound like a great thing on the surface, but tracking the S&P 500, for example, and reinvesting those dividends has been a pretty lucrative investment over the long term. If you're looking to add some diversification to your portfolio through index funds, our contributors have some ideas for you. Five index funds that look attractive today are the Vanguard Industrials ETF (NYSEMKT:VIS), the SPDR S&P Regional Banking ETF (NYSEMKT:KRE), the Vanguard FTSE All-World ex-US ETF (NYSEMKT:VEU), the WisdomTree SmallCap Dividend ETF (NYSEMKT:DES), and the Schwab U.S. Dividend Equity ETF (NYSEMKT:SCHD). Here's a quick breakdown of why you should consider these in 2017. Neha Chamaria (Vanguard Industrials ETF): Index funds aren't always broad based, and they can be a great way to play sectors that look promising without having to hand-pick stocks, which can be a daunting task. Industrials have seen a sharp rebound after Donald Trump's victory. I believe the trend should continue, which is why I'm picking Vanguard Industrials Index Fund. As the name suggests, this fund is a pure industrials play. It tracks the performance of the MSCI US IMI Industrials 25/50 index, which includes more than 300 industrial stocks covering nearly every subindustry. Almost 49% of Vanguard Industrials' portfolio comprises industrial conglomerates, machinery, and aerospace and defense stocks. Its top holdings include heavyweights like General Electric, 3M, Boeing Co, Union Pacific Corporation, and Honeywell International. The prospects of machinery and defense stocks have improved on the back of Trump's proposed infrastructure and defense spending plans. General Electric -- Vanguard Industrials' largest holding at 11% -- not only could benefit if Trump pushes for energy and infrastructure reforms, but it's also likely able to withstand any adverse implications of Trump's protectionism policies thanks to its diversified portfolio. 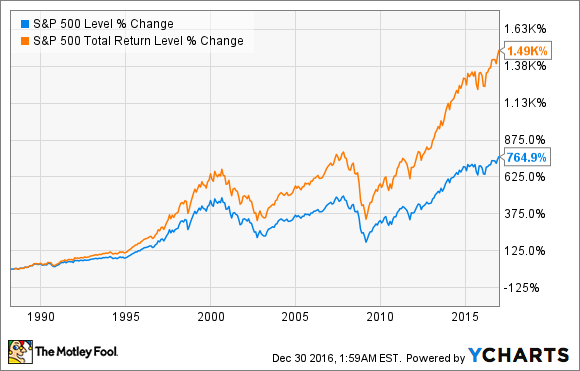 Overall, I believe Vanguard Industrials is a great option to play a potential industrials upturn under Trump's presidency. Vanguard Industrials' expense ratio of 0.10% is also among the lowest -- its peers command an average fee of 0.46%. The fund might have had a good run-up in 2016, but at only 10 times trailing earnings and a yield of 2%, Vanguard Industrials is a great low-cost option if you want exposure to industrial titans without taking on too much risk. Dan Caplinger (SPDR S&P Regional Banking ETF): Interest rates have been at rock-bottom levels for years, and that has made things somewhat difficult for the regional banks that you'll find among the holdings of the SPDR S&P Regional Banking ETF. However, things are now looking up for the sector, and if current trends continue, 2017 could be a very good year for earnings at the nation's smaller banks. Early in 2016, regional banks took hits from two quarters. First, many small banks had made extensive loans to energy companies, many of which suffered big financial hits as a result of the plunge in crude oil prices at the beginning of the year. In addition, after a single interest rate increase at the end of 2015, the Federal Reserve quickly made it clear that it would be slow to boost the Fed Funds rate any further, and that sent longer-term interest rates downward and squeezed interest rate margins. Since then, though, many factors have started to turn in favor of regional banks. Crude has climbed back above the $50- per-barrel mark, and that has allowed many companies that borrowed from regional banks to restart production and get their loans paid down. Over the past two months, moreover, investors have regained confidence in the economy, and that helped spur the Fed to boost rates again. Longer-term rates have also soared, restoring a more favorable yield curve. With this ETF offering exposure to some of the best regional banks in the business, strength for the sector should translate to further gains for the fund in 2017 and beyond. Tyler Crowe (Vanguard FTSE All-World ex-US ETF): It's a big world out there, and investors who want to grab a piece of global growth need to look beyond American stocks. One of the fastest and easiest ways to add a big jolt of international diversification to your portfolio is with Vanguard's FTSE All-World ex-US ETF. One of the major benefits of buying this ETF is that it's a low-cost option for this kind of exposure. Typically, trading fees for stocks listed on foreign stock exchanges are much higher than for those traded on U.S. exchanges. With this ETF, though, you're only paying a 0.13% expense ratio, which is pretty much on par with similar ETFs that focus on domestic assets. Another reason it's worth taking a look at this particular index fund for the coming year is that this may be one of the most opportune times to consider foreign-based companies. With the S&P 500 trading at a rather high cyclically adjusted P/E ratio of 28, valuations are looking pretty frothy in the U.S. While it isn't a hard-and-fast rule, a valuation that high suggests expected returns from U.S.-based stocks won't be as great in the coming years. Conversely, the valuations of foreign markets are looking much more attractive today. Data sources: Multipl.com and Star Capital. Another thing to consider is that the U.S. dollar is at its strongest in close to 15 years, according to the Real Trade Weighted U.S. Dollar Index. Not only does this mean our purchasing power abroad will go further today, but as the relative strength of the dollar reverts to the mean, foreign companies will benefit. I can't say with 100% certainty that the U.S. dollar's value will decline, and if it does, I don't have the slightest clue when it will occur. That said, the odds are in favor of a weakening dollar in the coming years. Add it all up, and you get a situation where our purchasing power is at its strongest when asset valuations abroad are much more attractive than at home. The payoff for this investment may not come in 2017, but the buying window for the Vanguard FTSE All-World ex-US ETF looks pretty open this year. Daniel Miller (WisdomTree SmallCap Dividend ETF): It's very likely my colleagues will be picking funds from the Vanguard family. Vanguard is Netflix while the industry is Blockbuster; Vanguard is dominating, and according to Morningstar, it's attracted more than 100% of the industry's new assets over the past two years. In an attempt to be contrarian, though, I've chosen the WisdomTree SmallCap Dividend ETF, which offers a unique option for investors. It's one of the few options for investors who want a small-cap-focused dividend strategy, simply because small caps are often less profitable and riskier than larger companies, which offer a potentially more stable dividend. However, focusing on small-cap dividend stocks can offer investors a greater return potential as well as a dividend, which can be the best of both worlds. While it's diversified, the fund does have a greater exposure to consumer discretionary, industrials, and utilities and less exposure to technology, financial, and healthcare stocks. Its 12-month yield through the end of November was a healthy 2.92%, and its five-year average return an impressive 16.47%. As a bonus, its 0.38% expense ratio makes it one of the cheapest small-cap value funds around. Ultimately, if you're looking for a fund to anchor your portfolio with income as well as upside, you can't go wrong with WisdomTree's SmallCap Dividend ETF. Low costs and a healthy yield? Yes, please. Evan Niu, CFA (Schwab U.S. Dividend Equity ETF): One of my favorite index funds, which currently comprises nearly 10% of my family's portfolio (including tax-sheltered college savings accounts for the kids for extra compounding), is the Schwab U.S. Dividend Equity ETF. It's been a longtime holding that I consistently add to on a regular basis, and it's been a steady performer for years. With an expense ratio of just 7 basis points, it's also price-competitive with Vanguard funds. It tracks the Dow Jones U.S. Dividend 100 Index, and it does so with extremely low tracking error. Vanguard does not offer a competing ETF that tracks that particular index, but you can see that 7 basis points undercuts several of Vanguard's other dividend-oriented ETFs in terms of fees. The Schwab U.S. Dividend Equity ETF yields around 2.6% at current levels, and as its name suggests, it's entirely concentrated within domestic equities. 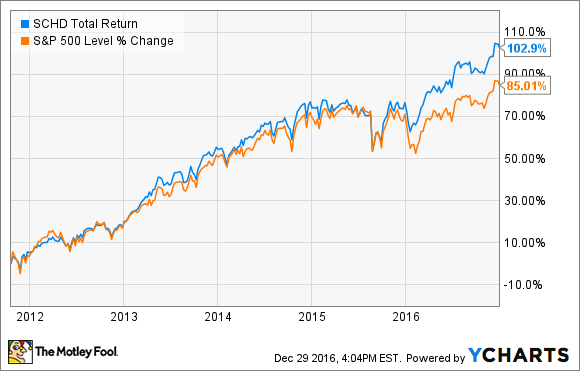 Including reinvested dividends, the fund has also outperformed the S&P 500since its inception in 2011, with much of that outperformance having been generated over the past year. SCHD Total Return Price data by YCharts. Of course, the S&P 500 is not the benchmark index (and by definition, no index ETF outperforms its underlying index), but it's still useful context for how this fund performs. It has grown quite a bit since 2011 and now has $4.7 billion in assets under management, showing its growing popularity among investors seeking income. After posting a strong 2016, perhaps the Schwab U.S. Dividend Equity ETF can do likewise in 2017.